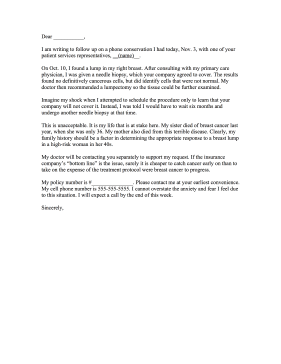 Concerned with HMO, this health insurance complaint letter can be filed when coverage is lacking or denied. I am writing to follow up on a phone conservation I had today, Nov. 3, with one of your patient services representatives, __(name)__. On Oct. 10, I found a lump in my right breast. After consulting with my primary care physician, I was given a needle biopsy, which your company agreed to cover. The results found no definitively cancerous cells, but did identify cells that were not normal. My doctor then recommended a lumpectomy so the tissue could be further examined. Imagine my shock when I attempted to schedule the procedure only to learn that your company will not cover it. Instead, I was told I would have to wait six months and undergo another needle biopsy at that time. This is unacceptable. It is my life that is at stake here. My sister died of breast cancer last year, when she was only 36. My mother also died from this terrible disease. Clearly, my family history should be a factor in determining the appropriate response to a breast lump in a high-risk woman in her 40s. My doctor will be contacting you separately to support my request. If the insurance company's "bottom line" is the issue, surely it is cheaper to catch cancer early on than to take on the expense of the treatment protocol were breast cancer to progress. My policy number is #_______________. Please contact me at your earliest convenience. My cell phone number is 555-555-5555. I cannot overstate the anxiety and fear I feel due to this situation. I will expect a call by the end of this week.